The drone allegedly used by some persons to monitor the house of a former governor has been confiscated by security operatives. 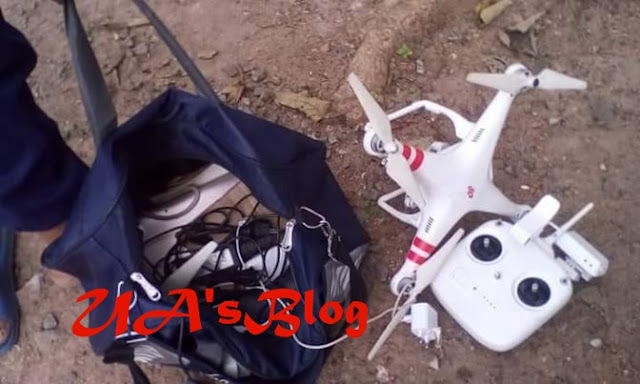 Two persons, a lady and a young man (names unknown), have been arrested over alleged monitoring of the premises of former governor, Chief Olusegun Osoba, situated within the Ibara GRA with a drone. This was contained in a statement issued by a former member of the House of Representatives, Hon. Adekunle Adeyemi, on behalf of Chief Osoba, on Tuesday, in Abeokuta, that those arrested had been handed over to security operatives for investigation. This development according to Adeyemi was one out of many alleged series of security breach and threat on the person of the ex-governor of the state. The statement had it that a security staff working with Osoba noticed the flying drone, brought it done and got those behind it arrested. It was gathered that Osoba, a leader of the All Progressives Congress (APC), just returned back to the country early on Tuesday, to prepare for a private meeting with members of the party, over a peaceful conduct of the Presidential party primary scheduled for Friday. Adeyemi in the statement said the premises, some years back, was invaded by unknown people who dug out buried armoured cable in a “professional manner”.